Recently communities have begun embracing home drug testing as a way of mediating conflicts and confronting drug use, especially in the home. In West Virginia, for example, Sheriff Vince Shambaugh has used money collected from drug dealers to purchase home drug tests, available for free pick up at his office. The tests range from a saliva drug test to a urine drug test. To read more about the Sheriff's initiative please visit WTAP's site here. 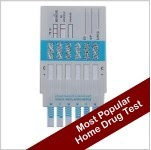 You can also buy saliva and urine drug tests at Home Health Testing by checking out the Home Drug Test category page http://www.homehealthtesting.com/drug-tests-c-21.html. Schools have begun providing a similar service to parents. Instead of having your child tested at a school, you can pick up a home drug test and test them privately and in less embarrassing circumstances. This is the approach the United Independent School District has taken in Laredo, TX, where at home drug tests can be picked up free of charge by parents. You can learn more about their program here at the Laredo Morning Times page. If you wish to follow the example of these organizations, you can purchase affordable and confidential home drug tests from Home Health Testing. Aside from saliva and urine drug tests you can also buy from Home Health Testing a hair drug test with lab services and the power to determine a 90 day drug history. For more information please check out the variety of drug tests available at Home Health Testing.com http://www.homehealthtesting.com.